If you go to a rescue or shelter looking to adopt a second dog, talk to the staff about your dog, his personality and the types of activities you and the rest of your family like to do. The adoption counselor can help to guide you to a dog who may be a good choice as a second dog. Before you finalize an adoption, you should bring your dog to the animal care and adoption center to meet the prospective new dog on neutral territory. An adoption counselor will help you with the introduction. This will take place in a get-acquainted room or in an outdoor exercise area. Both dogs will be leashed during this first meeting. Significant aggression (such as growling, showing teeth, stiffening and barking) from one or both dogs is not a good sign, and you should consider adopting a different dog. If the introduction at the adoption center goes well and you are prepared for the added responsibility of a second dog, you are ready to finalize the adoption and take your new dog home. What next? Set up a confinement area (a separate room with a crate in it) for your new dog with all his supplies such as food/water dishes, a bed, a crate, toys and food. All these things will be for your new dog and kept separate from your existing dog until he arrives. Pick up all toys, bones, food bowls and the resident dog’s favorite items from your home and put them in a safe place. These special items should be kept away from both dogs initially until they have adjusted to one another. Most fights between dogs are over food and prized possessions such as toys, so be aware of what the dogs have access to in your home for at least the first month. Feed both dogs separately for at least a week. Only feed together if you can directly supervise them with your undivided attention. When you have completed the adoption and are bringing the new dog to your home for the first time, you will want to take both dogs for a walk together in your neighborhood so they can get re-acquainted on neutral territory. Next, confine the resident dog to one part of the house while the new dog explores the rest. Then switch their territories. This allows each to become familiar with the other’s scent. For face-to-face introductions, start with limited, supervised exposure, preferably outdoors in a fenced-in yard, with the new dog on leash and your resident dog off leash. (Note: Leashing only the new dog will allow you to maintain control of the situation.) Keep your leash loose and let the dogs explore one another. Praise appropriate behavior. If it seems safe to do so, you can even feed both dogs treats keeping some distance between the dogs. If the interaction seems to be going well, move the introduction indoors, keeping the new dog on leash. Reward good behavior, and redirect their attention if you sense tension building. Praise when the dog reorients to you. Keep all dog play time and interactions positive and brief. This will help avoid over stimulation and quarrels which may erupt with overly rough play or extended play. Always confine the new dog when you are not present to supervise. Keeping the new dog in a crate away from the resident dog is a good idea. Try to keep the new dog’s crate in a separate room where you can close the door so the resident dog does not tease the new dog in his crate. Even when the two dogs seem to be tolerating each other well, continue for at least one month to confine the newcomer when you are not home. Keep their first unsupervised time together short and gradually increase it. 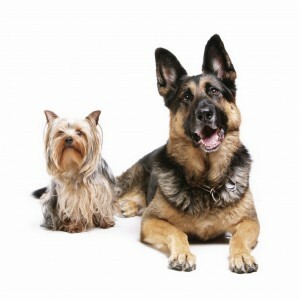 Train both dogs separately to sit and stay on cue, in order to create calm behavior in both dogs. Make sure each dog gets some quality time with you separately from the other dog. Remember that the dogs will decide their relative status on their own. 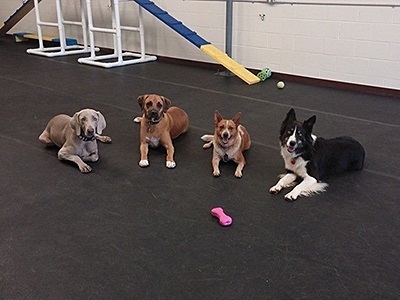 The resident dog may not be the “top dog.” Their status is not set in stone, and it is perfectly normal for dogs to challenge one another from time to time. Often you will not even be aware of the challenges. If you sense that a conflict is brewing, redirect their attention by engaging them in other activities or physically separating them. If the newcomer is a puppy, do not allow the puppy to badger the resident dog. Redirect the puppy’s attention toward you. Praise the puppy for reorienting to you. Begin teaching the puppy some basic obedience commands from the day he or she comes into your home. You will need to confine the puppy when you cannot be present to supervise for several months. Even if both dogs are adults, you may not be able to leave them together, unsupervised and unconfined, for some time. It may take them several months to reach a comfort level with one another. A few dogs can never be left alone together. If things are not progressing as you would like, call us at 803.210.9380, we can help!